I wasn’t very productive today. I didn’t find a job. I didn’t watch the World Cup. I didn’t finish the second trench tile. I didn’t even watch a film. 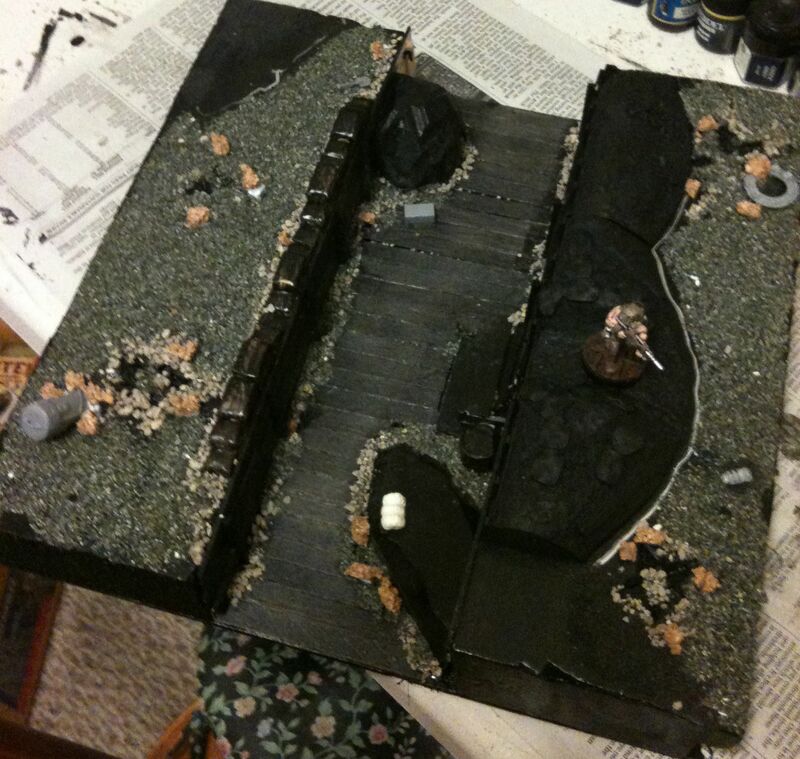 However I have worked on the trench tile. I did watch “All Quiet on the Western Front” last night and I’ve been reviewing my other research material, principally two books. “The Canadian Corps in World War I”, is an Osprey title, perhaps the first one I bought. It has a Van Doo on the cover and I pretty much will do a unit of them, how big of a unit I’m not sure. Three officers and 116 enlisted men would be the best number. The other book I bought is called “Postcards from the Trenches”, it is real postcards produced during the Great War that this collector ultimately donated to a museum and they produced the book. It and the film reveal that my trenches may be too orderly, but other material shows it was all a matter of what sector the photos were taken in. The Canadians or the Stormtroopers as the Germans dubbed them were always sent where the fighting was thickest Vimy, Ypres, the Somme. Hopefully after the drybrush things look fine. My two observations are it is better to leave a small gap between planks on the ground as it is easier to get the brush in there, requires less planks, and is more historically accurate. The second observation is I don’t need quite as much grit inside the trenches. Less grit but maybe more little detail bits. 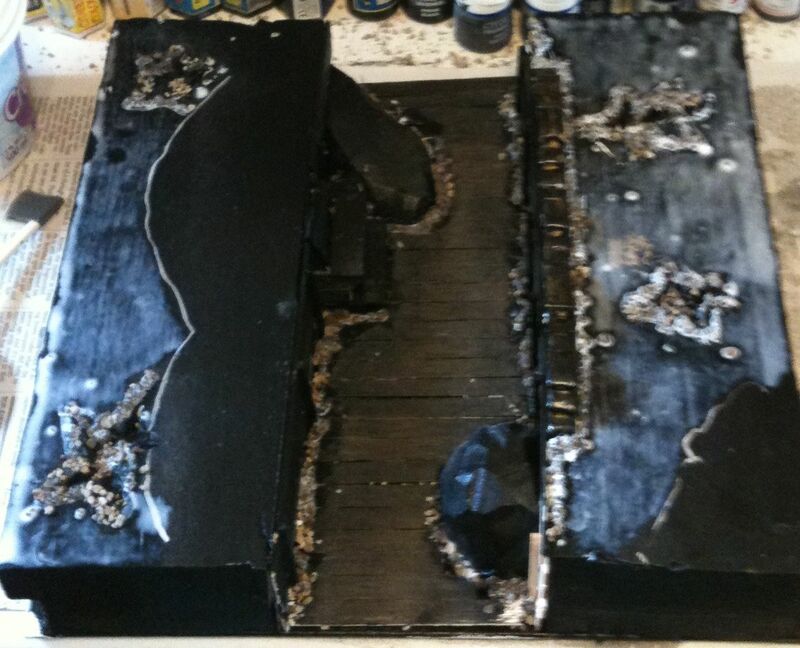 I found two more interesting links while reading threads over a the Lead Adventure forum which along with B&C, The Waaagh, and the Miniatures Page is my go to place to discuss painting, converting, terrain, and mini manufacturers. The first link is an informative page with pictures about life in the trenches of World War One along the Western Front primarily. The second link is to a new (to me) line of WW1 trench inserts. These would be inserted into correctly cut shapes of foam, saving all the bother of doing the planking and sandbagging by hand. They look pretty good, narrow, but big enough to accommodate 30mm bases apparently. 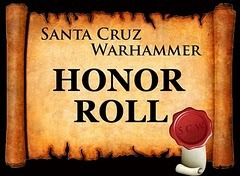 They are designed for 25/28 mm miniatures. I may have to give them a go, at least their machine gun nests when I make version 2.0 of No Musk’s Land. 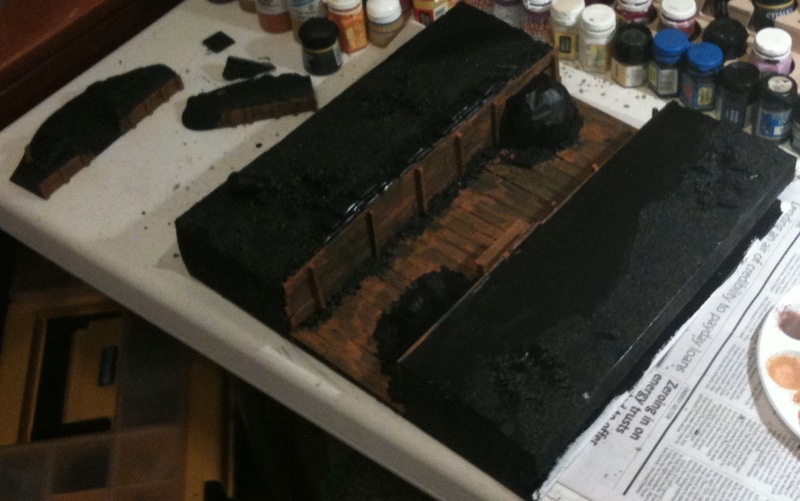 Tomorrow I’ll have to try harder to find a new job and it will be the drybrush fest as I will drybrush the planks, the sand and dirt, and the sandbags to match the first tile. So in and around looking for a job and doing research in the form of watching movies set in the trenches of World War One, I’ve been gluing grit, sand, cork, cat liter, etc to my latest trench table tile. The movies I’ve watched the last two nights are “Passchendaele”, which despite the guys at Happy Bats hatred of Paul Gross was useful as they were wearing Canadian uniforms. They didn’t spend much time in the trenches, more like in flooded craters. The next movie I watched had lots of flashbacks to the trenches in France, with French and German soldiers. Their trenches were flooded and they too had more ruined forests than I had planned on putting into my battle field. 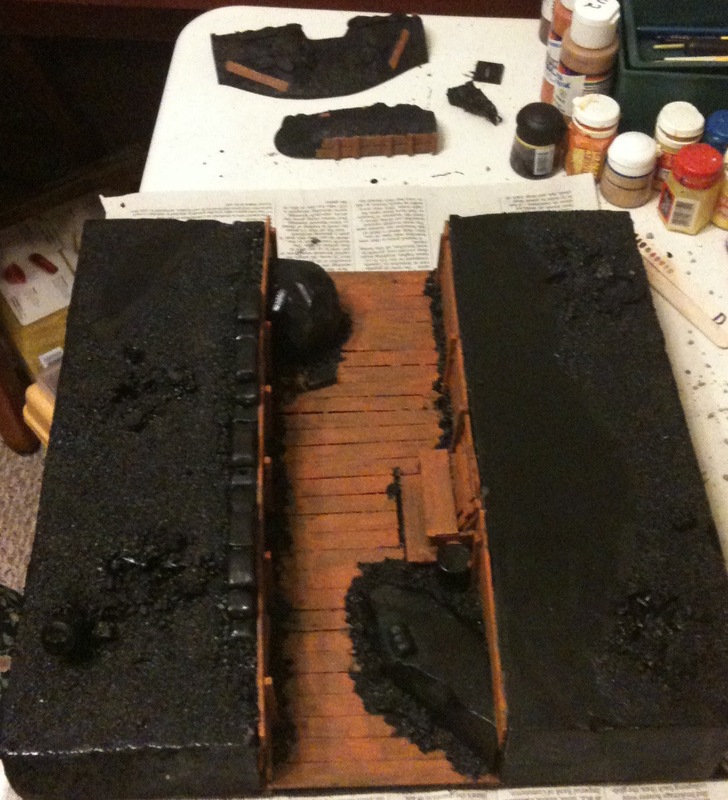 I may make some ruined forest type scatter terrain, but flooding all my trenches and craters… I’ll invest in some water effects at some point and fill the bottoms of a few craters just for fun, but I’m leaving my trenches as is. Some of the trenches in “A very long engagement” were not lined with wood, especially on the ground. This is counter to my own research. I did see lots of sandbags and barricades made of wood as well as barbed wire and telegraph lines. I think the trenches look better filled with stuff, so this tile has more plastic bits glued both in and outside the trenches. 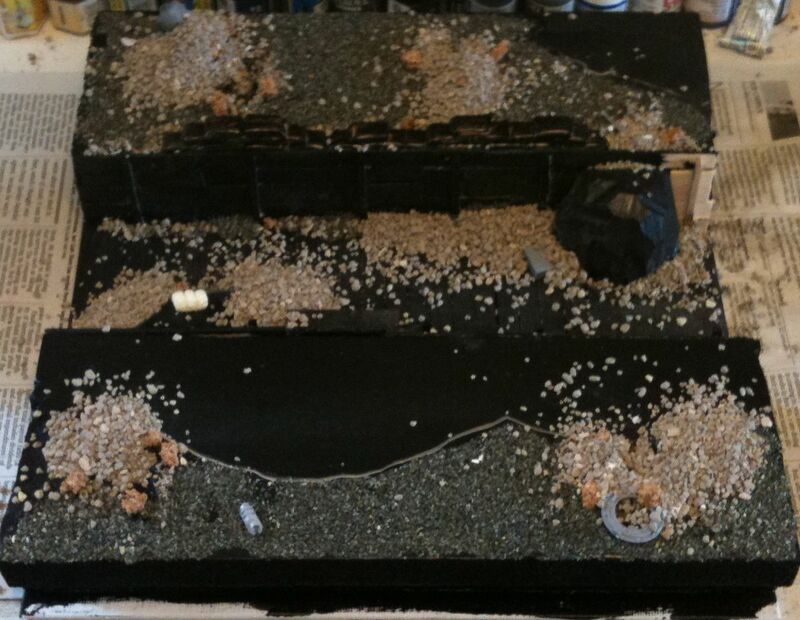 I have to remember that I will have plenty of larger scatter terrain too. I also plan to name my trenches and fortified positions. This was a common practice, the trench in “A very long engagement” was named “Bingo Crépuscule“, a name I may give to one of my trenches, as it is both obscure and realistic at the same time. Soldiers often gave humorous or ironic names to places they were stationed. My first choice of films for WW1 is “Paths of Glory” which I own, but it is in black and white and film making, the technical side has advanced a lot since that earlier but still awesome Kubrick film. The other rapid suggestion was “Black Adder goes Forth” which I also own. Most of that series is spent in HQ or in the front line bunker/sleeping quarters for Black Adder and Baldrick. I’ll have to look for some more trench warfare movies. Wikipedia has this list of WW1 films. There was just a goal in the World Cup! Spain is up 1-0 at the 62nd minute. I’ve seen “Joyeux Noël” recently, maybe that influenced me in starting my trench project, most of that movie takes place in the trenches. It also shows how close the enemy really was to each other, they could yell back and forth. It was less than a football pitch wide in place. “Joyeux Noel” has some useful extras for learning more about what really happened in the trenches of WW1 as censoring the press was still prevalent back then. I generally followed the same order and techniques I used on the first tile. This time I used thinned glue earlier, more beach sand, glued on plastic details sooner, and then added cork and finally another layer of cat liter. That is the current state of the tile, the glue is home drying on the cat liter and maybe later tonight I can begin painting things black. Remember to gob on a bit and dab it onto the grit rather than paint in proper brush strokes. 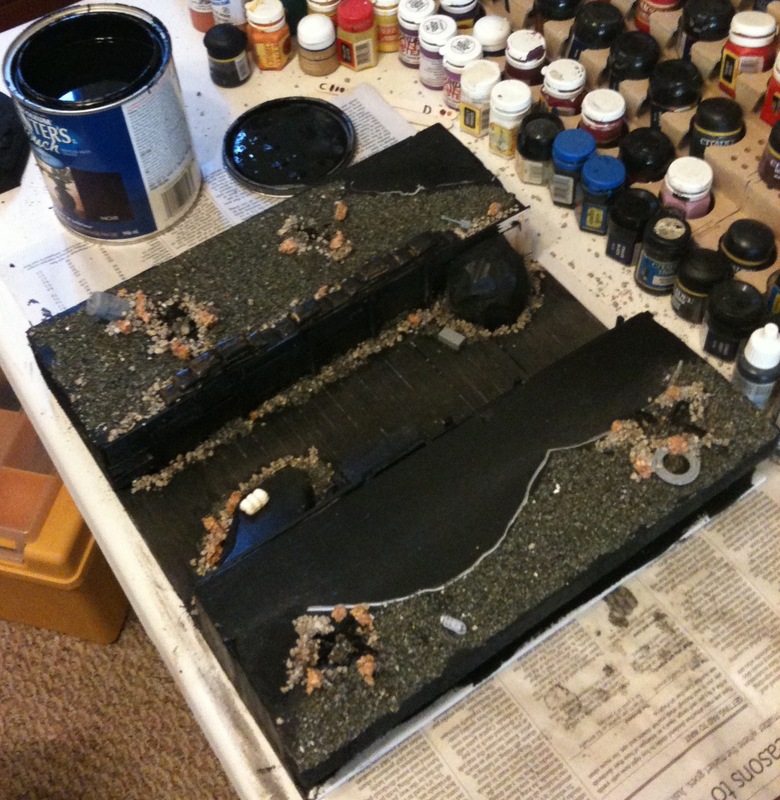 Once the girt is good and covered in black, the drybrushing begins. Is dry brushing one or two words?